Have you ever been given the wrong dosage or the wrong medicine? Medication can cause illness or injury under some conditions, according to the Institute of Medicine (IOM). For example, a very strong drug may carry a greater risk of harmful side effects. See also: AARP Health Record is a safe place to manage your family's health information. But sometimes doctors, pharmacists or patients make errors — in prescribing a medication, in filling the prescription, or in taking the drug. These errors can be prevented. According to the IOM, approximately 1.5 million preventable adverse drug effects occur in the United States each year. Use the below health tools to help you navigate and organize your medical information. Recognize that all medicines have risks as well as benefits. Respect the power and value of medicines when properly used. Remember that medicine safety is also about personal responsibility; learn what you need to know to use your medicine safely and appropriately. Here are additional tips for doing your part to avoid errors at the doctor’s office, the pharmacy and at home. Make a list of questions before your visit and bring it to your appointment. Bring an updated list of all the prescription and over-the-counter medicines you take, including herbal supplements. If your doctor prescribes medicine for you, confirm the name of the drug and the dose. Be sure you understand how, when and for how long you should take it. Read your notes back to the doctor to be sure they're correct. Ask the doctor or nurse to explain what the drug will do. Ask if any lab tests will be needed to check how the drug is working in your body. Ask about side effects. If prescription costs are a concern, ask about a generic or lower-cost brand name medication that works just as well. Write down the information you receive. When you take the prescription to the drugstore, bring a copy of your list of medicines and over-the-counter drugs that you take. Some pharmacies keep a list of the drugs you get from them. Ask for a copy so you can make sure the information is up-to-date. You will probably be told to sign an electronic log or clipboard when you hand in your prescription or when you receive it. Signing this means you know your "HIPAA" (federal privacy law) rights and, in many pharmacies, that you have received an offer to be counseled by the pharmacist. By signing it, you are acknowledging that you do not want to talk to the pharmacist. If you would like to talk to a pharmacist, let the clerk or the pharmacist know that you have questions and want counseling. When you get your medicine, check that the drug's name and directions are the same as what your doctor told you. Consult with the pharmacist about how you should take the medication. 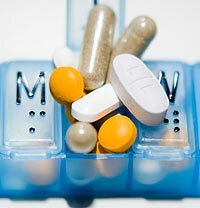 Ask about food-drug interactions, alcohol-drug interactions, and necessary monitoring tests. Make sure the pharmacist has your updated list of medications so the pharmacy can check for possible interactions, too. Keep your personal medication record (the list of prescription drugs, over-the-counter drugs and herbal supplements) updated. Give a copy to loved ones, keep a copy with you, and consider posting a copy on your refrigerator. Use a pill organizer so you can easily see if you need to take your medication or you already took it. You can fill it once a week. This reduces missed doses, reminds you that you took your medications, and avoids double dosing. A pill organizer can be really handy if you're helping someone keep track of their medicines. Read the written information that comes with your medicine carefully. It has important information about side effects, how to store it, interactions with other medications, and how and when to take your medicine. If you take more than one medication — and most 50+ adults do — enter your medication list into an online drug interaction checker, like AARP.org’s, to make sure your medications don’t interact with each other in a way that is harmful to you.